Hematologists are increasingly involved in the diagnosis and management of patients with venous and arterial thrombotic disorders. There have been major advances in recent years in our understanding of the central role of hypercoagulability in the pathogenesis of thrombosis. This has led to new approaches to the diagnosis of patients at risk for thrombosis and the development of more rational antithrombotic strategies. Thrombosis is the formation of a blood clot inside a blood vessel, obstructing the flow of blood through the circulatory system. When a blood vessel is injured, the body uses platelets and fibrin to form a blood clot to prevent blood loss. Even when a blood vessel is not injured, blood clots may form in the body under certain conditions. A clot, or a piece of the clot, that breaks free and begins to travel around the body is known as an embolus. In healthy people, homeostatic balance exists between procoagulant (clotting) forces and anticoagulant and fibrinolytic forces. Numerous genetic, acquired, and environmental factors can tip the balance in favour of coagulation, leading to the pathologic formation of thrombi in veins (e.g. deep venous thrombosis [DVT]), arteries (e.g. 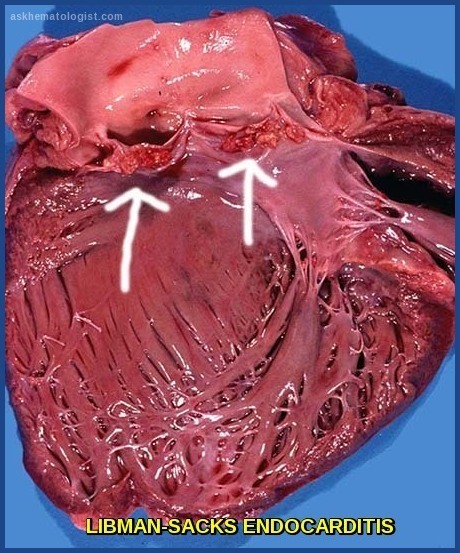 myocardial infarction, ischemic stroke), or cardiac chambers. 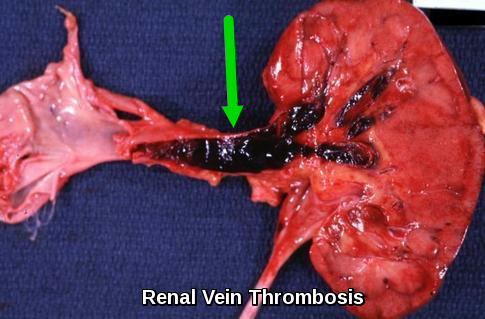 Thrombi can obstruct blood flow at the site of formation or detach and embolize to block a distant blood vessel (e.g. pulmonary embolism, embolic stroke). It is now recognised that most, if not all, patients with venous thromboembolism have a genetic basis for the disorder (“thrombophilia“). Clinical episodes of thrombosis are precipitated by acquired thrombogenic triggers, which may be overt (e.g., pregnancy) or subclinical. Factor V Leiden mutation causes resistance to activated protein C (APC). Mutations of factor V make it resistant to its normal cleavage and inactivation by activated protein C and predispose to venous thrombosis. Activated protein C (APC), in complex with protein S, degrades coagulation factors Va and VIIIa, thus inhibiting coagulation. Any of several mutations to factor V make it resistant to inactivation by APC, increasing the tendency for thrombosis. Factor V Leiden is the most common of these mutations. Homozygous mutations increase the risk of thrombosis more than do heterozygous mutations. Still, it is estimated that 95% of people with factor V Leiden never develop a clot. Factor V Leiden as a single gene defect is present in about 5% of European populations, but it rarely occurs in native Asian or African populations. It is present in 20 to 60% of patients with spontaneous venous thrombosis. A diagnosis of factor V Leiden thrombophilia may be considered in people with a notable personal or family history of VTE, such as having a VTE at an atypically young age, in an unusual location, or having multiple VTEs. Anticoagulation with parenteral heparin or low molecular weight heparin, followed by oral warfarin, is used for venous thrombosis or for prophylaxis for patients at increased thrombotic risk (eg, by immobilisation, severe injury, surgery). It is not yet known if the newer oral anticoagulants that inhibit either thrombin (dabigatran) or factor Xa (eg, rivaroxaban “XARELTO”, apixaban “ELIQUIS”) can be used in place of warfarin for this disorder. Prothrombin (factor II) is a vitamin K-dependent precursor of thrombin, the end-product of the coagulation cascade. A mutation of the prothrombin 20210 gene results in increased plasma prothrombin levels (with potentially increased thrombin generation) and increases the risk of venous thromboembolism. The prevalence of the mutation ranges from < 1% to 6.5%, depending on the population studied. The diagnosis is made by genetic analysis of the prothrombin 20210 gene using blood samples. Anticoagulation with heparin or low molecular weight heparin, followed by warfarin, is used for venous thrombosis, or for prophylaxis in patients at increased thrombotic risk (eg, by immobilisation, severe injury, or surgery). It is not known if the newer oral anticoagulants that inhibit either thrombin (dabigatran) or factor Xa (eg, rivaroxaban, apixaban) can be used in place of other anticoagulants for this disorder. Protein C is a vitamin K–dependent protein, as are coagulation factors VII, IX, and X, prothrombin, and proteins S and Z. Because activated protein C (APC) degrades factors Va and VIIIa, APC is a natural plasma anticoagulant. Decreased protein C due to genetic or acquired causes promotes venous thrombosis. Heterozygous deficiency of plasma protein C has a prevalence of 0.2 to 0.5%; about 75% of people with this defect experience a venous thromboembolism (50% by age 50). Homozygous or doubly heterozygous deficiency causes neonatal purpura fulminans, ie, severe neonatal disseminated intravascular coagulation (DIC). Acquired decreases occur in patients with liver disease or DIC, and during warfarin therapy. Diagnosis is based on antigenic and functional plasma assays. Patients with symptomatic thrombosis require anticoagulation with heparin or low molecular weight heparin, followed by warfarin. Use of the vitamin K antagonist, warfarin, as initial therapy occasionally causes thrombotic skin infarction by lowering vitamin K–dependent protein C levels before a therapeutic decrease has occurred in most vitamin K–dependent coagulation factors. It is not known whether the newer oral anticoagulants that inhibit either thrombin (dabigatran) or factor Xa (eg, rivaroxaban, apixaban) can be used in place of other anticoagulants for this disorder. 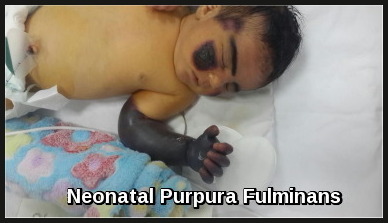 Neonatal purpura fulminans is fatal without replacement of protein C (using normal plasma or purified concentrate) and anticoagulation with heparin or low molecular weight heparin. Protein S, a vitamin K–dependent protein, is a cofactor for activated protein C–mediated cleavage of factors Va and VIIIa. Heterozygous deficiency of plasma protein S predisposes to venous thrombosis. Heterozygous protein S deficiency is similar to heterozygous protein C deficiency in genetic transmission, prevalence, laboratory testing, treatment, and precautions. Homozygous deficiency of protein S can cause neonatal purpura fulminans that is clinically indistinguishable from that caused by homozygous deficiency of protein C.
Acquired deficiencies of protein C (and, soon thereafter, protein S) occur during disseminated intravascular coagulation (DIC) and warfarin therapy. Diagnosis is based on antigenic assays of total or free plasma protein S (free protein S is the form unbound to the protein S carrier molecule, C4-binding protein). The treatment of protein S deficiency associated with venous thrombosis is identical to the treatment of protein C deficiency, with one exception. Because there is no purified protein S concentrate available for transfusion, normal plasma is used to replace protein S during a thrombotic emergency. Protein Z, a vitamin K–dependent protein, functions as a cofactor to down-regulate coagulation by forming a complex with the plasma protein, Z-dependent protease inhibitor (ZPI). The complex predominantly inactivates factor Xa on phospholipid surfaces. The consequence of protein Z or ZPI deficiency, or of autoantibodies to protein Z, in the pathophysiology of thrombosis and fetal loss is not completely clear; however, either defect may make thrombosis more likely if an affected patient also has another congenital coagulation abnormality (eg, factor V Leiden). Quantification of protein Z, ZPI, and protein Z autoantibodies is done in specialised regional laboratories by plasma electrophoresis, immunoblotting, and enzyme-linked immunosorbent assay. It is not yet known whether anticoagulant therapy or prophylaxis is indicated in protein Z or ZPI deficiency. Antithrombin is a protein that inhibits thrombin and factors Xa, IXa, and XIa, thereby inhibiting thrombosis. Heterozygous deficiency of plasma antithrombin has a prevalence of about 0.2 to 0.4%; about half of people affected develop venous thromboses. Homozygous deficiency is probably lethal to the fetus in utero. Acquired deficiencies occur in patients with disseminated intravascular coagulation, liver disease, or nephrotic syndrome, or during heparin therapy. Heparin exerts its anticoagulant effect by activating antithrombin. Laboratory testing is done for patients with an unexplained blood clot and involves quantification of the capacity of patient plasma to inhibit thrombin in the presence of heparin. Oral warfarin is used for prophylaxis against venous thromboembolism. It is not yet known if the newer oral anticoagulants that inhibit either thrombin (dabigatran) or factor Xa (eg, rivaroxaban, apixaban) can be used in place of warfarin in this disorder. Advanced age and atherosclerosis: Atherosclerosis increases the risk of arterial thrombi. Higher risk in patients with preexisting stenosis. When atherosclerotic plaques rupture, they expose or release tissue factor, activate coagulation, initiate local platelet adhesion and aggregation, and cause thrombosis. Immobilisation: Prolonged immobilisation and advanced age are considered to be important risk factors for VTE. Nevertheless, the need for VTE prophylaxis in long-term bedridden patients is not known. Venous stasis due to surgery, orthopaedic or paralytic immobilisation, heart failure, pregnancy, or obesity is a risk factor for VTE. Inflammation: Systemic inflammation is a potent prothrombotic stimulus. Inflammatory mechanisms upregulate procoagulant factors, downregulate natural anticoagulants and inhibit fibrinolytic activity. In addition to modulating plasma coagulation mechanisms, inflammatory mediators appear to increase platelet reactivity. In vivo, however, natural anticoagulants not only prevent thrombosis, but they also dampen inflammatory activity. 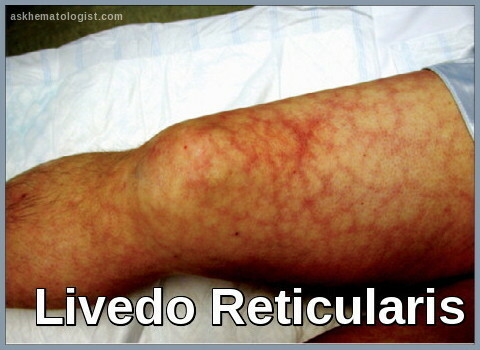 Infection, if severe (eg, sepsis): Increases risk of venous thrombosis. Increases expression/exposure of tissue factor by monocytes and macrophages. Pregnancy: Pregnant women are more likely to develop thrombosis than non-pregnant women of the same age. A clot can form at any stage of pregnancy and up to six weeks after the birth. The most common type of blood clot in pregnancy is deep vein thrombosis (DVT). 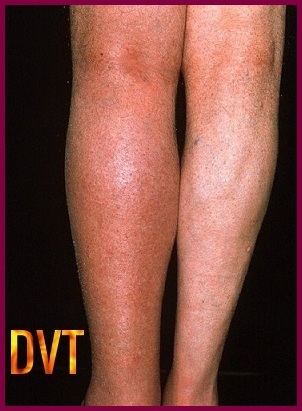 DVT can appear in the deep veins in the back of the leg, or in the calf or pelvis. Oral contraceptives that contain oestrogen: VTE is more frequent in patients who have a genetic abnormality that predisposes to venous thromboembolism and in women who smoke. Hormone replacement therapy (HRT): the risk of venous thromboembolism (VTE) is increased by oral HRT compared with baseline population risk. The risk of VTE associated with HRT is greater for oral than transdermal preparations. The risk associated with transdermal HRT given at standard therapeutic doses is no greater than baseline population risk. Consider transdermal rather than oral HRT for menopausal women who are at increased risk of VTE, including those with a BMI over 30 kg/m2. Consider referring menopausal women at high risk of VTE (for example, those with a strong family history of VTE or a hereditary thrombophilia) to a haematologist for assessment before considering HRT. Smoking appears to be a risk factor for venous thrombosis with the greatest relative effect among young women using oral contraceptives. Obesity: Obesity appears to be independently associated with both arterial and idiopathic venous thrombotic events. There are several mechanisms through which obesity can mediate its effects. The pro-thrombotic factors associated with obesity have been shown to improve with weight loss indicating that obesity is a modifiable risk factor for thrombosis. Diabetes: Atherothrombosis is the leading cause of morbidity and mortality in patients with diabetes mellitus. Several mechanisms contribute to the diabetic prothrombotic state, including endothelial dysfunction, coagulative activation and platelet hyper-reactivity. In particular, diabetic platelets are characterised by dysregulation of several signaling pathways leading to enhanced adhesion, activation and aggregation. These alterations result from the interaction among hyperglycemia, insulin resistance, inflammation and oxidative stress. Given the high prevalence of obesity and diabetes in the United States and the ageing of the population, the incidence of thrombosis is likely to increase. Cancer (especially adenocarcinoma): Cancer e.g. promyelocytic leukemia; lung, breast, prostate, pancreas, stomach, and colon tumors may activate coagulation by secreting a factor X–activating protease, by expressing/exposing tissue factor on exposed membrane surfaces, or both. Sickle cell anemia and other hemolytic anemias: Venous thromboembolism (VTE) is common in patients with sickle cell disease (SCD). The aetiology of increased risk of VTE in SCD patients is multifactorial and is related to both traditional factors and SCD-specific factors. Traditional risk factors such as central venous catheters, frequent hospitalisation, orthopaedic surgeries for avascular necrosis, and pregnancy may lead to increased incidence of VTE in the SCD population. In addition, SCD itself appears to be a hypercoagulable state, and many SCD-specific factors such as thrombophilic defects, genotype and splenectomy may modify the risk of VTE. SCD complications such as acute chest syndrome and pulmonary hypertension may also be related to VTE. Anticoagulation experts should be aware of these factors to help inform prophylaxis and treatment decisions. Hyperhomocysteinemia: may predispose to arterial thrombosis and venous thromboembolism, possibly because of injury to vascular endothelial cells. Some experts believe, however, that there is insufficient evidence definitively to link hyperhomocysteinemia to thrombosis. Plasma homocysteine levels are elevated ≥ 10-fold in homozygous cystathionine beta-synthase deficiency. Milder elevations occur in heterozygous deficiency and in other abnormalities of folate metabolism, including methyltetrahydrofolate dehydrogenase deficiency. The most common causes of hyperhomocysteinemia are acquired deficiencies of Folate, Vitamin B12, or Vitamin B6 (pyridoxine). Folate deficiency is rare in the Western world due to folate fortification of wheat flour. The abnormality is established by measuring plasma homocysteine levels. Plasma homocysteine levels may be normalised by dietary supplementation with folate, vitamin B12, or vitamin B6 alone or in combination; however, it is not been shown that this therapy reduces the risk of arterial or venous thrombosis. Heparin-induced thrombocytopenia: The pathophysiology involves antibody formation against the heparin-platelet factor 4 complex, with resultant thrombosis. 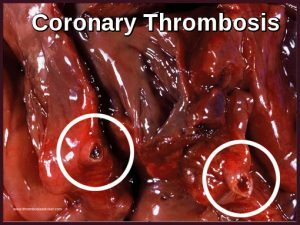 Thrombosis is usually venous, in the form of deep venous thrombosis or pulmonary embolism, but can be arterial as well, in the form of myocardial infarction or stroke. Antiphospholipid Syndrome (APS) is an important recognised cause of acquired treatable thrombophilia. It is characterised by the core clinical manifestations of thrombosis in both venous and arterial circulation resulting in recurrent thrombotic events, thrombocytopenia, and in women, it can also be associated with recurrent pregnancy losses and a major cause of pregnancy morbidity. Because thrombosis in APS can occur at almost any site, it is a condition that is seen in almost all medical specialities. APS occurs either as a primary condition or in the setting of an underlying systemic autoimmune disease, particularly systemic lupus erythematosus (SLE). * Superficial and deep vein thrombosis, cerebral venous thrombosis, retinal vein thrombosis. * Signs and symptoms of intracranial hypertension, pulmonary emboli, pulmonary arterial hypertension, and Budd-Chiari syndrome. * Arterial thrombosis – migraines, cognitive dysfunction, transient ischemic attacks, stroke, myocardial infarction, ischemic leg ulcers, digital gangrene, avascular necrosis of bone, retinal artery occlusion, renal artery stenosis, and, infarcts of spleen, pancreas, and adrenals. * Premature atherosclerosis – a rare feature of APS. * Coombs-positive hemolytic anemia and thrombocytopenia. * Fetal loss does not appear to be explained by thrombosis, but rather seems to stem from antibody-mediated interference with the growth and differentiation of trophoblasts, leading to a failure of placentation. * Discontinuation of therapy, major surgery, infection, and trauma may trigger Catastrophic APS. * Vascular thrombosis in any tissue or organ. * Pregnancy morbidity: One or more unexplained deaths of a morphologically normal fetus at or beyond the tenth week of gestation, One or more premature births of a morphologically normal neonate before the thirty-fourth week of gestation because of eclampsia, severe preeclampsia, or placental insufficiency, A 3 or more unexplained consecutive spontaneous abortions before the 10th week of gestation. Characteristic laboratory abnormalities in APS include persistently elevated levels of IgG and IgM antibodies directed against membrane anionic phospholipids or their associated plasma proteins or evidence of a circulating anticoagulant. * Antibodies against cardiolipin – aCL. * Antibodies against beta 2 glycoprotein I – B2GPI. * Lupus anticoagulant – LA. The lupus anticoagulant (LA) is suspected if the APTT is prolonged and does not correct immediately upon 1:1 mixing with normal plasma but does return to normal upon the addition of an excessive quantity of phospholipids (done in the clinical pathology laboratory). After the first thrombotic event, patients should be placed on warfarin for life aiming to achieve an INR ranging from 2.5 to 3.5, alone or in combination with 75 mg of aspirin daily. Pregnancy morbidity is prevented by a combination of heparin e.g. enoxaparin with aspirin 75 mg daily. Intravenous immunoglobulin 400 mg/kg daily for 5 days may also prevent abortions, while glucocorticoids are ineffective. Aspirin 75 mg daily protects patients with SLE positive for aPL antibodies from developing thrombotic events. It is not yet known if the newer oral anticoagulants that inhibit either thrombin (dabigatran) or factor Xa (eg, rivaroxaban, apixaban) can be used in place of heparin or warfarin for this disorder. Many patients with coexisting SLE are also treated with hydroxychloroquine (HCQ), which may have some benefit for patients at risk for complications of APS. Warfarin is contraindicated in pregnancy, as it passes through the placental barrier and may cause bleeding in the fetus; warfarin use during pregnancy is commonly associated with spontaneous abortion, stillbirth, neonatal death, and preterm birth. Idiopathic (unprovoked) venous thrombotic events are defined as the occurrence of venous thrombosis in the absence of any of the risk factors listed above. About 50% of patients presenting with a first idiopathic venous thrombosis have an underlying thrombophilia. Not a definitive test but should be determined in all patients with suspected DVT. Wells’ criteria are the most widely accepted algorithm used in the clinical diagnosis of DVT. 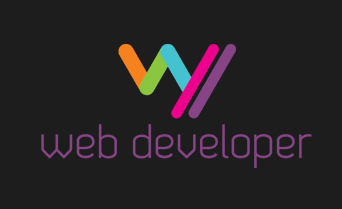 If the Wells’ score is 2 or greater, the condition is likely (absolute risk is approximately 40%). People with a score of <2 are unlikely to have a DVT (probability <15%). This test has not been validated in the pregnant population and, therefore, should not be routinely used to risk stratify a pregnant woman with a suspected DVT. A clinical prediction rule, termed the LEFt score, has been developed specifically for the pregnant population; however, this rule has yet to be rigorously validated and should also not be used routinely. Indicated if the pre-test probability of DVT is classified as unlikely (Wells’ score <2). If the D-dimer is normal, DVT is excluded in low-probability patients. If elevated, a venous duplex ultrasound is indicated for further investigation. Assesses venous flow by the use of Doppler and vein compression. First-line test in all high-probability patients (Wells’ score of 2 or more) or in low-probability patients (Wells’ score <2) with an elevated D-dimer level to assess popliteal, deep femoral, femoral, and common femoral veins. High sensitivity and specificity of over 95%. Ultrasound cannot provide the exact age of a vein clot, but it is better than all current imaging techniques in differentiating acute, subacute, chronic, and age-indeterminant venous thrombi. The initial test of choice for a pregnant woman suspected of having a DVT. The American College of Chest Physicians (ACCP) advocates the use of serial, proximal ultrasonography if a DVT is suspected in pregnant women. More accurate than ultrasound for visceral veins and deep veins of abdomen and pelvis. May be useful adjuncts, and may be helpful in ascertaining the extent of the DVT. Will show filling defects within the pulmonary vasculature with acute pulmonary emboli. When observed in the axial plane this has been described as the polo mint sign. 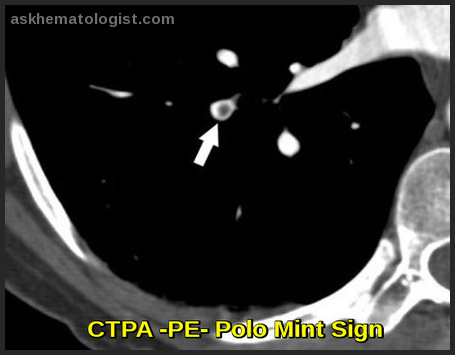 The central filling defect from the thrombus is surrounded by a thin rim of contrast, appearing like the popular sweet, the polo mint. Consider testing for hereditary thrombophilia in patients who have had unprovoked DVT or PE and who have a first-degree relative who has had DVT or PE if it is planned to stop anticoagulation treatment. Consider testing for antiphospholipid antibodies in patients who have had unprovoked DVT or PE if it is planned to stop anticoagulation treatment. Offer all patients diagnosed with unprovoked DVT or PE, who are not already known to have cancer, the following investigations for cancer: a physical examination (guided by the patient’s full history), CXR, blood tests (FBC, serum calcium and LFTs) and urinalysis. Consider further investigations for cancer, with an abdomino-pelvic CT scan (and a mammogram for women), in all patients aged over 40 years with a first unprovoked DVT or PE who do not have signs or symptoms of cancer based on initial investigation. Given that many cases of thrombosis do not have a clear cause, a myeloproliferative neoplasm could be involved. Thromboses are common in patients with polycythemia vera (PV) or essential thrombocythemia (ET). n a few patients, a myeloproliferative disorder (MPD) has been demonstrated to be present, especially in those in whom the thrombosis has occurred in an unusual location, such as in Budd-Chiari syndrome. Investigations to determine the presence of the single point mutation (V617F) of JAK2 are now readily available. This genetic study should be reserved for special cases, such as patients with thrombosis in uncommon sites or patients with cell counts suggesting the presence of a MPD. Refer people who are likely to have DVT for same-day assessment and management (local protocols may vary). * For patients with severe renal impairment or chronic kidney disease Stage 4 or 5 (estimated glomerular filtration rate <30 ml/min/1.73 m2), offer unfractionated heparin (UFH) with dose adjustments based on the activated partial thromboplastin time (aPTT) or LMWH with dose adjustments based on an anti-Xa assay. * For patients with an increased risk of bleeding, consider UFH. * Start the LMWH, fondaparinux or UFH as soon as possible and continue it for at least five days (or for those starting warfarin, until the international normalised ratio (INR) is 2 or above for at least 24 hours, whichever is longer. * Offer LMWH to patients with active cancer and confirmed proximal DVT or PE and continue the LMWH for six months. At six months, assess the risks and benefits of continuing anticoagulation. * Offer an oral anticoagulant to patients with confirmed proximal DVT or PE within 24 hours of diagnosis and continue for three months. Traditionally, the oral coagulant has been a vitamin K antagonist, usually warfarin. Recently, however, NICE has approved the novel non-anti-vitamin K antagonist anticoagulants (NOACs) – rivaroxaban, dabigatran, and apixaban – for use in the treatment and secondary prevention of DVT and PE. * NOACs remain under close scrutiny but many reviews suggest their advantages (most importantly the lack of necessity for monitoring, rapid onset and fewer interactions) outweigh disadvantages (particularly expense and the lack of an immediately acting antidote). * At three months, assess the risks and benefits of continuing anticoagulant treatment. Consider extending the anticoagulant beyond three months for patients with unprovoked proximal DVT if their risk of VTE recurrence is high and there is no additional risk of major bleeding. * Consider catheter-directed thrombolytic therapy for patients with symptomatic iliofemoral DVT who have symptoms of less than 14 days in duration, good functional status, a life expectancy of one year or more and a low risk of bleeding. * Provide patients who are having anticoagulation treatment with an ‘anticoagulant information booklet’ and an ‘anticoagulant alert card’ and advise them to carry the ‘anticoagulant alert card’ at all times. * Do not offer below-knee graduated compression stockings unless to manage symptoms. * Offer temporary inferior vena caval filters to patients with proximal DVT or PE who cannot have anticoagulation treatment; remove the inferior vena caval filter when the patient becomes eligible for anticoagulation treatment. * Consider inferior vena caval filters for patients with recurrent proximal DVT or PE despite adequate anticoagulation treatment, only after considering alternative treatments such as increasing target INR to 3-4 for long-term high-intensity oral anticoagulant therapy, or switching treatment to LMWH. * Thrombolytic therapy directed at the vein, increasingly directly by catheter (catheter-directed thrombolysis, or CDT) has had mixed results in studies. It appears to reduce the risk of post-thrombotic syndrome significantly; however, it is not clear whether it reduces risk of PE or recurrence of DVT. * Many individuals who have a first episode of DVT or PE will have a recurrent event. * Without anticoagulation, the risk recurrence of VTE (DVT or PE) is thought to be 50% within three months of a PE. Risk of recurrence within the first year of a VTE following three months of anticoagulation is thought to be 8%. * Risk of recurrence is reduced by the use of compression stockings. * The most serious complication of DVT is PE. The risk of PE is higher in proximal clots. * Thrombosis of the iliofemoral veins carries a worse prognosis with increased incidence of late clinical complications such as post-thrombotic syndrome. Post-thrombotic syndrome is a chronic venous hypertension, which may result in pain, swelling, hyperpigmentation, dermatitis, ulcers, gangrene and lipodermatosclerosis. It may develop after a DVT, due to damage to the deep veins and their valves. It affects 20-40% of patients after DVT of the lower limb and can have a significant impact on quality of life. Risks associated with the syndrome include older age, obesity, a history of previous ipsilateral DVT, iliofemoral location of the current thrombosis, failure to recover promptly from the acute symptoms and insufficient quality of oral anticoagulant therapy. There is a low risk of post-thrombotic syndrome in patients with asymptomatic DVT. VTEs often are preventable, with strategies that stop the development of clots in people “at-risk”. Healthcare professionals discern risk by gathering information about a patient’s age, weight, medical history, medications and lifestyle factors. The National Institute for Health and Care Excellence (NICE) has produced guidelines to assist in reducing the risk. NICE states that approximately 30% of surgical patients develop deep vein thrombosis (DVT). The condition is frequently asymptomatic but can lead to sudden death due to pulmonary embolism (PE). The risk of fatal embolism after high-risk surgery is 1-5%. Orthopaedic surgery (for example, total surgery for hip fracture). Major gynaecological surgery (but not caesarean). Urological surgery (including major or open urological procedures). Those at risk may take anti-clotting, or blood-thinning, medications or use mechanical devices such as compression stockings or compression devices. Getting out of bed quickly after surgery is also advised if possible. Avoid dehydration unless there is a specific clinical reason. Aspirin or antiplatelet agents should not be considered adequate prophylaxis. Consider temporary inferior vena cava filters for patients at a very high risk of VTE (eg, active malignancy or previous VTE event) if there are contra-indications to pharmacological and mechanical prophylaxis. These are devices which can be inserted into the inferior vena cava to prevent the development of a pulmonary embolus. There are currently no randomised controlled trials or controlled clinical trials that have assessed the benefit(s) of testing for thrombophilia on the risk of recurrent VTE. 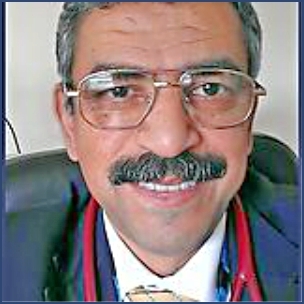 Paul Schick, MD; Hereditary and Acquired Hypercoagulability – https://emedicine.medscape.com/article/211039-overview – Updated: May 26, 2016. Furie B, Furie BC (2008). “Mechanisms of thrombus formation”. New England Journal of Medicine. 359 (9): 938–949. Handin RI (2005). “Chapter 53: bleeding and thrombosis”. In Kasper DL, Braunwald E, Fauci AS, et al. Harrison’s Principles of Internal Medicine (16th ed.). New York, NY: McGraw-Hill. K.A.L. Darvall, R.C. Sam, S.H. Silverman, A.W. Bradbury, D.J. Adam, Obesity and Thrombosis, European Journal of Vascular and Endovascular Surgery, Volume 33, Issue 2, February 2007, Pages 223-233, ISSN 1078-5884, https://www.sciencedirect.com/science/article/pii/S107858840600579X. Omar El-Gaby, MD FRCP (2010). ‘Are there evidence-based strategies in the treatment of Antiphospholipid Syndrome in pregnancy?’ MSc dissertation in Rheumatology, Hammersmith Hospital, University of London. Rabih Nayfe, Imad Uthman, Jessica Aoun, et al. Seronegative antiphospholipid syndrome, Rheumatology (Oxford) (2013) 52 (8): 1358- 1367. https://academic.oup.com/rheumatology/article/52/8/1358/1790830/Seronegative-antiphospholipid-syndrome. Accessed: February 2013. Negrini S, Pappalardo F, Murdaca G, Indiveri F, Puppo F. The antiphospholipid syndrome: from pathophysiology to treatment. Clin Exp Med. 2016 Jun 22. Useche JN, de Castro AM, Galvis GE, Mantilla RA, Ariza A. Use of US in the evaluation of patients with symptoms of deep venous thrombosis of the lower extremities. Radiographics. 2008 Oct. 28(6):1785-97. Michiels JJ, Oortwijn WJ, Naaborg R. Exclusion and diagnosis of deep vein thrombosis by a rapid ELISA D- dimer test, compression ultrasonography, and a simple clinical model. Clin Appl Thromb Hemost. 1999 Jul. 5(3):171-80. Mary Harding, Cathy Jackson. Deep Vein Thrombosis. https://patient.info/doctor/deep-vein-thrombosis-pro. Last Checked:31 July 2015. Breccia M, Morano SG, D’Andrea M, Russo E, D’Elia GM, Alimena G (2005) Budd-Chiari syndrome as the first manifestation of polycythemia vera in young women with inherited thrombophilic state: an aggressive form of myeloproliferative disorder requiring multidisciplinary management. Eur J Haematol 75:396–400. Venous thromboembolic diseases: the management of venous thromboembolic diseases and the role of thrombophilia testing; NICE Clinical Guideline (June 2012, updated Nov 2015). Venous thromboembolism in adults admitted to hospital: reducing the risk; NICE Clinical Guideline (January 2010). Dabigatran etexilate for the treatment and secondary prevention of deep vein thrombosis and/or pulmonary embolism; NICE Technology Appraisal Guidance, December 2014. Apixaban for the treatment and secondary prevention of deep vein thrombosis and/or pulmonary embolism; NICE Technology Appraisal Guidance, June 2015. Rivaroxaban for the treatment of deep vein thrombosis and prevention of recurrent deep vein thrombosis and pulmonary embolism; NICE Technology Appraisal Guidance, July 2012. Mekaj YH, Mekaj AY, Duci SB, et al; New oral anticoagulants: their advantages and disadvantages compared with vitamin K antagonists in the prevention and treatment of patients with thromboembolic events. Ther Clin Risk Manag. 2015 Jun 24 11:967-77. doi: 10.2147/TCRM.S84210. eCollection 2015. 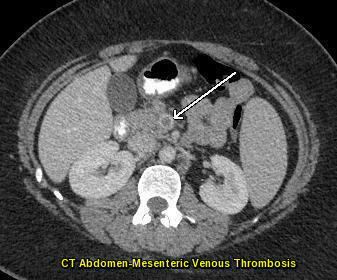 Watson L, Broderick C, Armon MP; Thrombolysis for acute deep vein thrombosis. Cochrane Database Syst Rev. 2014 Jan 23 1:CD002783. doi: 10.1002/14651858.CD002783.pub3. Goldhaber SZ, Bounameaux H; Pulmonary embolism and deep vein thrombosis. Lancet. 2012 May 12 379(9828):1835-46. Epub 2012 Apr 10. Prandoni P, Kahn SR; Post-thrombotic syndrome: prevalence, prognostication and need for progress. Br J Haematol. 2009 May 145(3):286-95. Epub 2009 Feb 13. Thrombosis is the formation of a blood clot inside a blood vessel, obstructing the flow of blood through the circulatory system. A clot, or a piece of the clot, that breaks free and begins to travel around the body is known as an embolus.